Find out how the East Empire Company sets its prices. Speak to Mevure Hlen at the Tailors and Dyers Hall in St. Olms. 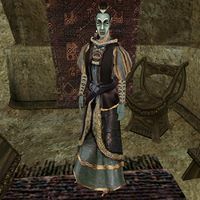 Obtain the Letter From Llaalam Dredil in a locked chest at the East Empire Company Hall in Ebonheart. Return to Hlen for a two point bonus to the Mercantile skill. You can only receive this quest after delivering a letter for Llaalam Dredil in Ebonheart. Once this is done, speak with Mevure Hlen at the Tailors and Dyers Hall on the St. Olms Waistworks level who wants to know how the East Empire Company in Ebonheart sets its prices. You'll have to return to Ebonheart to seek the letter's contents. J'Zhirr has placed the letter that you seek in a locked chest behind a locked door near where he stands. Unfortunately, this room is well guarded so take your chances and pick the lock, and pay the resulting fine if you are caught (or just kill everyone if that's your thing), or use a chameleon spell to help conceal you. Bring the letter back to Hlen to receive a two point bonus to the Mercantile skill. Quest stage 35 can never be obtained. 10 Mevure Hlen is a Clothier in the St. Olms section of Vivec. She is apparently unhappy with the high prices of importing materials for her shop. Because of it, she is forced to sell her goods at higher prices than normal. 20 Mevure Hlen suspects that she is being gouged by the East Empire Company, and that they may be artificially inflating prices. She would like me to try and steal a price list from the offices of the East Empire Company in Ebonheart. 30 I have agreed to try and get a price list from the East Empire Company. 35 I have agreed to try and get a price list from the East Empire Company. I believe that the package I delivered to J'Zhirr may be exactly what Mevure Hlen is looking for. 40 Finishes quest I have decided not to help Mevure Hlen. 50 Finishes quest I have retrieved the price list from J'Zhirr at the East Empire Company and returned it to Mevure Hlen. She was visibly upset by the contents, and vowed to find another supplier for her inventory and immediately lower her prices. Mevure Hlen was right about one thing: I have learned a few things about business, and will be more successful in my business dealings henceforth.